Photos of the flag can be seen here and here. 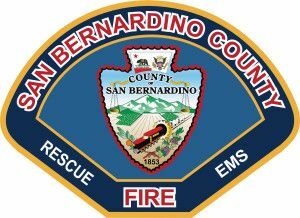 The county flag is 1:2:1 horizontal blue-white-blue with the county seal on the hoist side of the white stripe followed by lettering (guess..."San Bernardino County"). 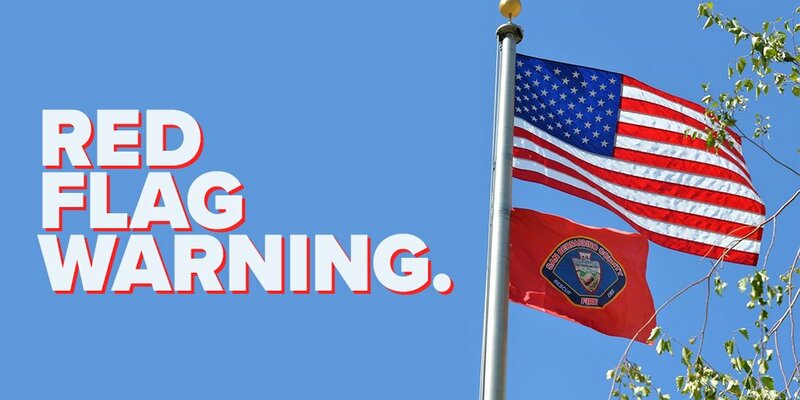 The flag looks like 1:2. 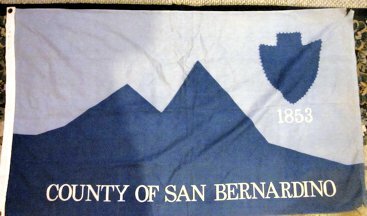 A better photo of the San Bernardino county flag can be found at www.flickr.com/photos/dimachron/2965019163. On this photo two shades of blue stripes are visible, and the inscription on flag is "County of San Bernardino", not "SAN BERNARDINO". Also a better image of the county seal can be seen here: images.civicheraldry.com/119/sanbernardino_county_seal_n9089.gif. 2) The seal on the Ontario flag is significantly larger. Flag was posted on eBay - a grey field with a blue silhouette of two mountains, and a blue scalloped arrowhead in the upper fly, with the date 1853 in white below it. The flag features the sheriff's office seven-pointed star badge centered on a white field. The field itself is enclosed within a double border of black and gold. The badge, meanwhile, surmounts a black and gold striped ribbon folded behind the star.